In an obvious response to the anti-government protests, president Aleksandar Vucic starts with the political campaign under the motto “The future of Serbia”. He promised he would visit almost all of the municipalities in Serbia. The protest, initiated by students and supported by the opposition, started in Belgrade in early December. In the meantime, demonstrations have spread throughout Serbia with many university professors and actors as fresh supporters. Vucic’s campaign also coincides with the document “Agreement with the People” which opposition leaders have signed and published on Wednesday. Reiterating his assault and criticism against the opposition, Vucic said that he wants to hear the problems of the citizens, making distinction between his rivals and common people. Nikola Selakovic, the president’s secretary general, who is also an official of his Serbian Progressive Party (SNS), said today that the decision to launch the campaign “Future of Serbia” has not been taken “suddenly”. He also suggested that the campaign could be a sign of possible snap general election. “President Vucic neither works suddenly, nor does he make unadvised moves. Campaigns like these occur also in other countries; their objectives are to demonstrate the performance (of the government) and to talk with the people”, Selakovic told state-owned Radio-Television of Serbia (RTS). Selakovic did not confirm nor denied that the campaign has something to do with the possibility of a snap election, criticizing opposition leaders “who are always focused on themselves”. 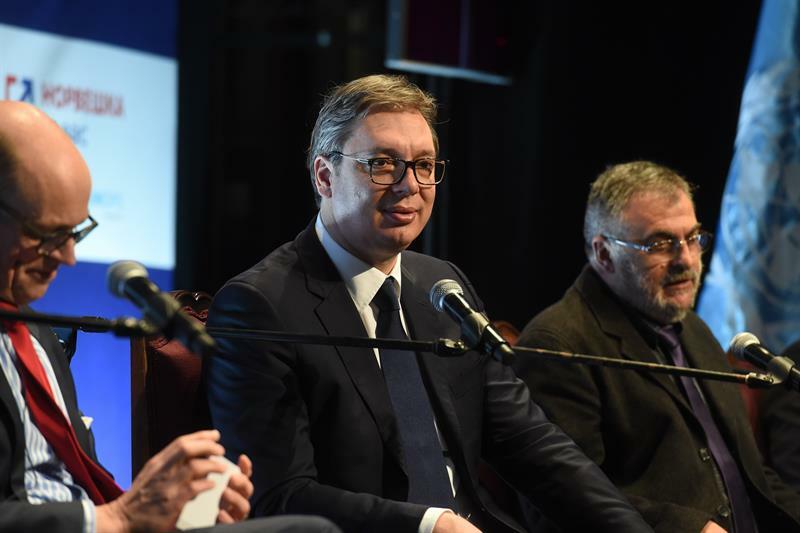 When asked whether this means that Vucic’s campaign is not connected with a possible early resort to the polls, he replied that he “did not say such a thing”. “You know that there are many of us in SNS who are always supportive to the idea of an election… but the president is the one who makes decisions because he is the most experienced and possesses the great wisdom to judge what is in the interest of the state, not only the interest of the party”, he concluded. Earlier today, government’s vice-president and SNS official Zorana Mihajlovic said that “the opposition leaders promise everything they did not do when they were in power, and fail to say what are their plans are regarding Kosovo, the economy, EU accession, infrastructure modernization; they are trying to present their selfish interests as the will of the people”. As for the opposition’s “Agreement with the People”, she said that the SNS rivals “misuse the frustrations of the citizens and hide themselves behind the ‘experts’ government’ instead of presenting their own ideas and program”. In its “Agreement with the People”, alongside with its plan for an experts’ provisionally government, in the first point of the document the opposition pledges to fight for free media and a free election; if the preconditions for free elections are not fulfilled, the opposition will not take part in them.